Manduša Heritage Apartments are tribute to classical style fully adapted to the demands of modern living. Each of these exceptional apartments carries itself a special charm and love of details. Our aim was to create a place for the gourmets of the luxury of living who appreciate timeless classics. What we are especially proud to present are signed photos of most famous Croatian photographer, Marija Braut. Highly modern ambience spiced up with temperamental pieces of furniture manufactured by hand, Empire Apartment is classically designed interior that will satisfy different tastes. Swarovski crystal lighting, porcelain lamps, antique objects, and luxurious Spanish fabrics create perfect illustration of aristocratic lifestyle. Spacious Italian designer's bathroom is fully equipped with free towels, toiletries, and walk-in shower. Sophisticated atmosphere in this apartment will make you feel timeless beauty and elegance of historical Zagreb. Apartment is a size of 52 square meters and it consists of one bedroom with super king bed (size 180 x 200 cm / 71 x 79 in), bathroom, living room with sofa bed (160 x 200 cm / 63 x 79 in), dining area, and fully equipped kitchen. Taking into consideration that where one stays makes a profound impact on one’s impressions while travelling, we wanted to inspire your greatest memories. The Manduša Heritage Apartments, as well as Zagreb, is a perfect place for those who are seeking for something interesting, but never the same. Highly modern ambience spiced up with temperamental pieces of furniture manufactured by hand, Empire Apartment is classically designed interior that will satisfy different tastes. Spacious Italian designer's bathroom is fully equipped with free towels, toiletries, and walk-in shower. 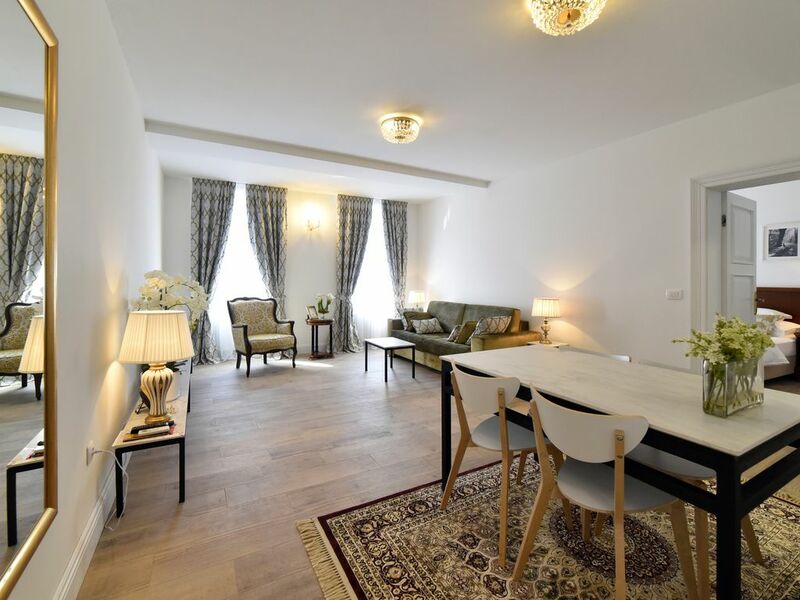 Sophisticated atmosphere in this apartment will make you feel timeless beauty and elegance of historical Zagreb. Located on the 2nd floor in historical building originally constructed for the King’s chancellor. we are dedicated to the traditions and habits that we love and therefore we decided to keep up with the royal treatment for its guests. Comfort and elegance are not a luxury – it is a lifestyle. This is what we stand for. Thus, if you are sophisticated, slightly spoiled but yet extremely charming culture lover dedicated to beauty, heritage, art, and hedonism, Manduša is a place to be. When we travel, we want to be treated even better than home. Check it – we guarantee it can happen! Spacious Italian designer's bathroom is fully equipped with free towels, toiletries, and walk-in shower. Smartphone with Croatian SIM card provided for 5 EUR per day. Central heating through entire apartment. Italian espresso capsule are free of charge. Dining area for up to 5 people. We really did enjoy our week here during the Christmas markets. Ana was a friendly host. El apartamento es fantástico 😊, totalmente nuevo y muy céntrico. Muy recomendable. Superb location in Zagreb centre.